Understanding mesothelioma and its staging are important for patients affected by the disease, as well as those who love and care for them. It is a form of cancer that invades the mesothelium, which is a protective membrane that lines most of the body’s internal organs. 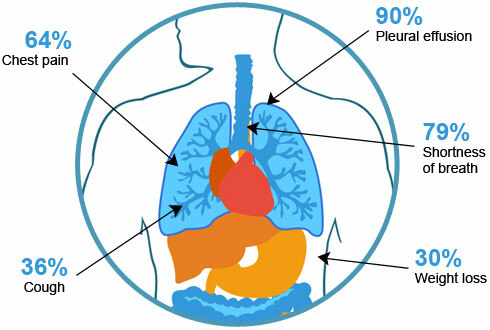 Three out of every four cases of mesothelioma originate in the pleural mesothelium (lining of the lungs) of the chest cavity. However, the disease can also begin in the abdominal cavity and around the heart. Regardless of their origins, malignant cells from the mesothelium can penetrate and damage nearby tissues. Furthermore, cancer cells can also metastasize, or spread, to other regions of the body. Mesothelioma is a rare and aggressive form of cancer with a high morbidity rate. In many cases, by the time the disease is diagnosed, the cancer is advanced and has spread. The five-year survival rate for this form of cancer is approximately 5 to 10 percent. Most patients with this form of cancer die as a result of pneumonia or respiratory failure. In some cases, patients battling the disease will develop small-bowel obstructions or intestinal issues when tumors invade the abdominal cavity and penetrate the diaphragm. In rare cases, some patients will die of cardiac complications when tumors invade the pericardium, which is the sac that surrounds the heart, and even the heart itself. Approximately 3,000 new cases of this form of cancer are diagnosed in the U.S. annually. The primary risk factor linked to the development of mesothelioma is working with asbestos. Asbestos is a group of minerals characterized by thin microscopic fibers. It is known for its resistance to fire, heat, and chemicals. Moreover, asbestos does not conduct electricity. As a result, it has been mined and used widely among commercial industries, such as shipping, construction, automotive, and other related industries. Furthermore, it has also been used for military applications over the last several decades. When asbestos fibers are released into the air, they can be swallowed or inhaled. As a result, serious health issues can often ensue. To date, approximately 75 percent of all cases can be linked to asbestos exposure. Moreover, there is also some evidence to suggest that family members and others living with workers exposed to asbestos have an increased risk of developing mesothelioma and other related diseases. This risk may be linked to asbestos dust brought home on the hair and clothing of asbestos workers. There are also reported cases of mesothelioma in people living close to asbestos mines. As part of understanding mesothelioma and its staging, it is also important to note that there are individuals suffering from this form of cancer without any known exposure to asbestos. Some other possible causes of the disease include radiation exposure, zeolites (which are minerals chemically related to asbestos), genetics, and SV40 virus, which is a simian virus that was found in some forms of the polio vaccine between 1955 and 1963. Another important aspect of mesothelioma is that the disease does not manifest symptoms until decades after the patient’s initial exposure. In many cases, it could be 20, 30, or even 50 years before symptoms arise. This delayed onset can make diagnosis and treatment of the disease quite difficult. 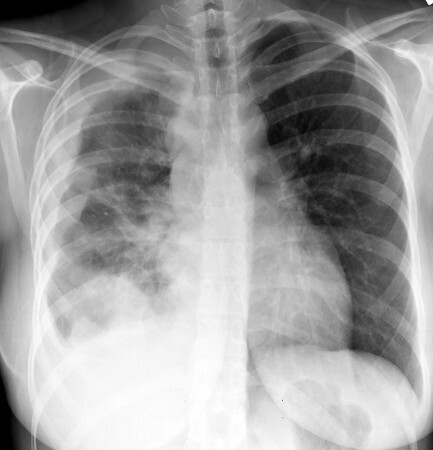 The main symptoms of pleural mesothelioma include chest pain and shortness of breath. Moreover, there can also be an accumulation of fluid in the lungs caused by the disease. If this accumulation of fluid is significant, it may also contribute to and/or exacerbate the shortness of breath experienced by the patient. Typically, this form of cancer is diagnosed after a patient consults a doctor with symptoms, such as shortness of breath, fatigue, weight loss, lower back pain, fever, abdominal pain, and/or swelling. However, these symptoms alone do not mean a patient has this form of cancer. In order to confirm a mesothelioma diagnosis, a complete medical history, physical exam, and diagnostic tests must be done. Due to the rare nature of the disease, mesothelioma can often be misdiagnosed and/or mistaken for other ailments initially. That is why a comprehensive medical history is compiled. Among other possible risks, the doctor will determine a patient’s exposure to asbestos and other potential irritants. Moreover, the physician will quiz their patients on their overall general health and perform a physical exam to check for signs of the disease. If someone is experiencing symptoms and the physical exam reveals signs of fluid in the chest and/or abdominal cavity, the doctor will likely send the patient for additional testing. Mesothelioma testing involves blood tests to evaluate osteopontin and soluble mesothelin-related peptide (SMRPs) levels, as well as fluid and tissue sample tests. If these tests yield abnormal or inconclusive results, further diagnostic testing will likely be ordered. It is important to note that even if a doctor does not find mesothelioma cells in fluid samples, it does not rule out the presence of the disease. In many cases, tissue biopsies are required to diagnose this form of cancer. Other forms of testing used to diagnose the disease include thoracoscopy (examines the space between the lungs and chest wall), laparoscopy (examines the inside of the abdomen), mediastinoscopy (examines the center of the chest around the sternum and heart), and various forms of image testing, such as chest X-ray, computed tomography (CT), positron emission tomography (PET), and magnetic resonance imaging (MRI) scans. The mesothelioma stages describe how far the disease has spread from where it first appeared in the protective lining of the lungs, abdomen, or heart. The spread of the disease is referred to as metastasis. The farther mesothelioma has progressed, the later or more advanced doctors stage the disease. Via the use of imaging tests and biopsies to determine the cancer stage, the results of the diagnosis help the doctors decide which treatments will best suit a patient’s needs and have the most positive impact on their prognosis. Like most cancers, the disease is diagnosed via four stages. The doctor may also refer to the cancer staging of mesothelioma as early or advanced. Early–stage mesothelioma includes stages 1 and 2. Meanwhile, advanced–stage mesothelioma includes stages 3 and 4. In Stage 1, the disease has not spread to the lymph nodes and the cancer is localized to one side (one lung) of the body. This is the earliest stage of this form of cancer and patients have the most treatment options available to them. Mesothelioma sufferers also tend to be more responsive to treatment in the early stages. In Stage 2, the disease is still localized to one side (one lung) of the body, but there has been metastasis to nearby lymph nodes. There are aggressive treatment options available, including surgery. In Stage 3, the disease has exhibited significant signs of metastasis. It has spread to lymph nodes and surrounding organs. If cancer has spread to other regions of the body, symptoms may include pain, difficulties with swallowing, or swelling of the neck or face. At this stage, the treatment options and use of surgical intervention are more limited. In Stage 4, the cancer has progressed to the other side of the body (both lungs). This is often referred to as end-stage cancer. The treatment options for end-stage patients usually focus on alleviating symptoms and “comfort care measures,” which entail making the patient as comfortable and pain-free as possible. Meanwhile, symptoms of abdominal (peritoneal) mesothelioma often include fever, weight loss, swelling and pain in the abdomen, blood clotting abnormalities, anemia, and bowel obstructions. Due to the rarity of these conditions, doctors do not use stages to describe the spread of peritoneal or pericardial mesothelioma because they do not encounter enough cases to accurately stage them. As a result, patients with these forms of cancer are described as having either localized or advanced forms of the disease. Nonetheless, an experienced doctor can still assess how far the cancer has spread and which treatments will work best to improve a patient’s prognosis. Understanding mesothelioma and its staging are essential for patients affected by the disease, their mental health, as well as the health of their loved ones. It is a form of cancer that invades the mesothelium, which is the protective lining for most of the body’s internal organs. 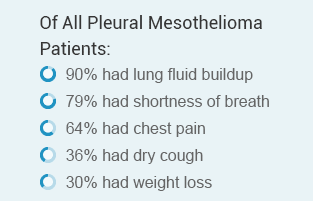 While 75 percent of mesothelioma cases originate in the pleural mesothelium and chest cavity, the disease can also begin in the abdominal cavity and around the heart. Regardless of their origins, malignant cells from the mesothelium can penetrate and damage nearby tissues as well as organs. Furthermore, the cancer cells can also metastasize to other regions of the body. 14 Responses to "Understanding Mesothelioma and Its Staging"